How do I buy a (paper) plan? How do I download a plan? How do I print a plan at full size? How do I submit a plan to Outerzone? What is a 'vintage' plan exactly? What is a 'good quality' plan? What format are the plans in? What started the whole idea? How does this site work, I mean technically? How does this site work, I mean how do plans get listed? How many plans can Outerzone hold? What is the data model, I mean what data types are used in the database? What happens in the long term? Disaster recovery? Posterity? You can't. There are no paper plans here, and there's nothing to buy. Also, we don't want your money. All the plans here are in digital format - and they are all free to download. Find the orange/red 'Plan File' button, and click it. If that doesn't work for you, then see the download help page. Note 18/04/2015: If you have a (recent, new) problem downloading the plans, first thing to check is this: try doing a right-click on the download link and save the file, instead of the normal left-click. This fix seems to work 9 times out of 10. This is (I guess) because you won't load the file into a browser plugin to view (usually Adobe Reader), you will just grab the file, period. 1. The first (cheap) solution is to use your home PC and printer to do a 'tiled' print onto several sheets of A4 paper, then assemble those sheets together with sticky tape. Currently (Nov 2013) I recommend Acrobat Reader XI to do this. This is a free program from Adobe - you can download it here and then install and use it to print tiled PDF plans. ... and then click 'Print'. The plan will then print out out as a jigsaw of 12 x separate A4 'tiles'. Assemble these tiles together into the full size plan, using some scissors and the sticky tape of your choice. Done. If this explanation has not worked out for you, then try the Adobe help pages online for more detailed help with all this. 2. The second (and less cheap) solution is to copy the plan PDF onto a USB memory stick and then take that in person to your local print services supplier, who will happily do the printing for you, in return for some money. If you have a plan you want to submit, that's great. Be aware we have no way to deal with paper copies, so plans must be scanned and emailed. Any format will do: pdf, jpg, tiff, png, whatever you've got is fine. If you are doing the scanning yourself and wondering what settings to use, then a good starting point would be greyscale and 400dpi (although we do have some tutorial pages here if you want to go into more detail). Then just email it here to admin@outerzone.co.uk along with any details you have on the designer, year, etc. Also please try and keep emails under 25MB total filesize. Thanks. If you have files that are too large to email, then we recommend the WeTransfer file service. It's simple, fast and free. Currently (Oct 2017) you can send us files up to 2GB that way. Outerzone is a listing of free vintage plans for flying model airplanes that have been found on the internet. Many sites on the internet host model plans. Outerzone is designed to keep those plans safe. This is because having a duplicate copy of everything is always always a good idea. If any one of those sites should cease to function, we want the plans still to be available for users to download. Because I like old plans. And I do not want to see public domain plans slowly disappear from the internet over time. I want to save them for future modellers, future collectors, for all time. Save them into some kind of secure depository, that will not die out, that has a workable disaster recovery plan. The 2nd big reason to do this is to have everything, all the plan titles and dates and author information and description, encoded into a MySQL database that allows fast, complex searches. Also, I want to see more stick and tissue models in the sky. This clearly is not a perfect system, but it is at least a start. I expect this incarnation of Outerzone to be in many ways flawed and maybe also unpopular. But the point is that it is a useful beginning. At some point in the future we (someone?) can then take this and use it as a foundation to build something better. It is a plan that shows how to make a flying model airplane, using traditional techniques. This tends to mean stick and tissue style construction. People differ on the definition by date of what is a vintage plan. Some say 1940. Myself, I'd say anything dated before 1960. But for the purposes of this site let's say before 1970. This is flexible - often plans are redesigned and redrawn years later on, but still have vintage styling and construction. Let's not be too sniffy about dates. I would hate to exclude plans that are vintage in spirit but not in date. 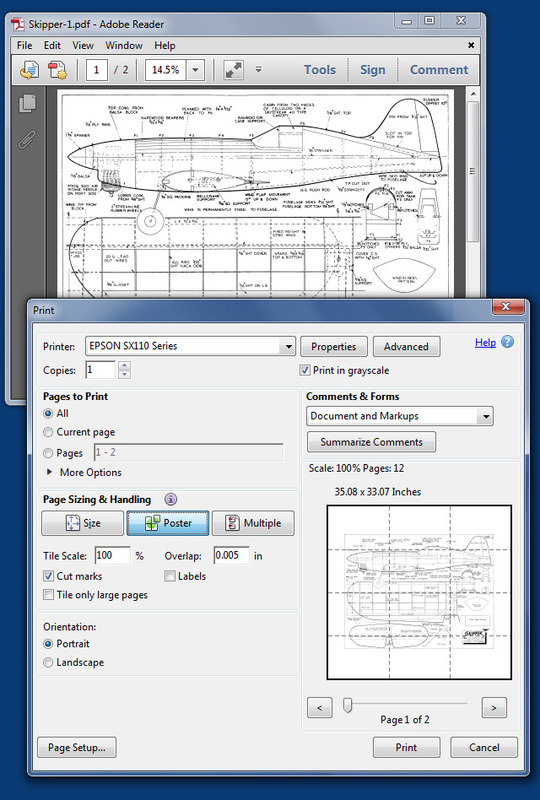 A good quality plan is one you can immediately print out and use to build a model plane. Hopefully the plans on Outerzone are all of good enough resolution that they can be used for construction. I would call a bad quality plan one that is unclear when printed out (eg too low in resolution), and would be difficult to build a model with. A 3-view is not a plan. A 3-view just shows the outside shape of an airframe. A plan has detailed information and description of the materials used and the shapes of the internal formers, and the parts that will fit together, to make a complete flying model. Plans are in PDF format. That's Adobe Acrobat. This is in some ways just an accident of history. Many people would say pdf is a stupid choice of format, and in many ways I would agree. But we are where we are. One good thing about using pdf as the standard is that now (in 2011) with the free software Adobe Reader X, anyone (well, anyone with a PC and an internet connection and a printer) can produce full-sized plans tiled and printed onto A4 paper. Then start building a model. The other usable option (on this server) is zip. So if a plan cannot (for some strange reason) be a pdf, then it must be a zip file. There is a thread at RCgroups http://www.rcgroups.com/forums/showthread.php?t=1265873 titled - Vintage & Old-Timer Plans (started by Scott - Orange&White) - that as of 24.03.11 has 197 pages and by my count about 1,600 vintage plans available for download. That one thread on that one website is full of PDF format vintage goodness that simply cannot be allowed to fade away. That started me thinking. Outerzone is designed to gather plans from places like that - from any and all websites that host free plans - and to keep them safe for the future. A volunteer finds a vintage plan of merit, somewhere out there on the web. They login here and insert a new entry onto this listing, with some helpful details about the plan and its history, and where it was found. They upload the plan to this server (into a quarantine area). They also upload a small thumbnail pic of the plan. Optionally, they can also upload a thumbnail pic showing the finished model. Shortly thereafter, that plan gets either allowed and approved to go live, or it doesn't. By me. Plans that are not approved are usually the subject of copyright concerns, or unsuitable because of date of origin, or perhaps construction style (broadly speaking, if it's a profile model - yuk - or involves foam construction). Ahem. That's about it. Other volunteers can then also come along and add more notes to each entry in the listing. That's just how it has worked out, at this point. And you know it's funny, but I kind of like it that way. I don't want to seem ungrateful to the good people who have helped out in the past. I'm just saying... this is where I am at now. For the avoidance of doubt, when I say 'I do it all' I am talking about the maintenance, the running, of this website. I don't mean that I find, or digitally clean, all of the plans. Plans come in from a surprising number of sources now, and I am eternally grateful to everyone who has helped out by finding, cleaning and submitting plans. The database itself is industrial strength, and will hold many thousands of records. Lets say 250,000. Safe to say we will all wear out before the database does. But the actual PDF files are not in the database. They sit on the server, taking up webspace. We do have only finite webspace - exactly 20GB of it. That means we can hold 25,000 plans on here assuming each plan (with thumbnails) is an average 800KB and assuming there's nothing else in our space here at all. I think this is too small a limit, I want this to be an exhaustive solution with room to spare, I think there are more than 25,000 vintage plans in the world - but we will deal with that issue when it arises. At the moment I'm thinking we'll archive say the first 10,000 plans at that point, move them somewhere we can link to, then keep rolling. Each plan exists as a PDF (or zip) file along with a (640 x 480 pixel) JPG thumbnail image, and an entry in the database. Also if possible, there is a 2nd smaller image (320 x 240 pixel) that shows the finished model. Formers int unchecked, incomplete or complete. I am not a database guru. There will be neater and more elegant ways of doing this, I'm sure. Main concern at the moment is to get a working system up and running. Can then start tweaking later. I think once we have a database that actually is full of data, it will get more interesting. We can always export the data from this table into different formats - CSV whatever - and build something else (something more elegant?) out of it. Got requests for fields we should put in the database? email me. It is my hope and understanding that all the plans listed here on this site are out of copyright, and in the public domain. If you believe otherwise, please contact me. If you own the copyright of a particular plan that is currently listed here, let me know and I will remove that plan from this listing. Since there will be volunteers (ie people other than me) adding plans to this listing, they will be less worried about legal liability than I am, so - and this is important - if I delete a plan from this listing because of copyright concerns, that is final. It's gone. We cannot have arguments about this. This is a not-for-profit operation. Use of the site is free. Downloading plans is free. There are no subscriptions, no charges. Site administrators volunteer their time freely. The only money involved is the cost of hosting the site and advertising revenue. Yeah, that'll make me rich. I'll just go order an Aston Martin now. Want to make a donation? If you want to make a small contribution then click here to donate using Paypal. And bless you. Good question. We are hoping, after all, to save these vintage plans for posterity. Ok. There will be a weekly library backup of (1) the MySQL database (2) All the PDF plan files (3) All the thumbnail images, and (4) the ASP pages and scripts that constitute the site. If (when) this site does fail, that complete library backup will be released for download in more than one public server location, and hopefully a new group of volunteers will grab that library backup then use it to create a new (and better?) site that can carry on into the future. I will be working on a better solution to this. Any suggestions are welcome. My name is Steve. I live near Bradford in West Yorkshire UK, and I like old model plans. Sometime, I hope to get around to building models. My question is not listed here. How do I get an answer?